Our five nights stay in Busan had come to an end and it was time to head back home. 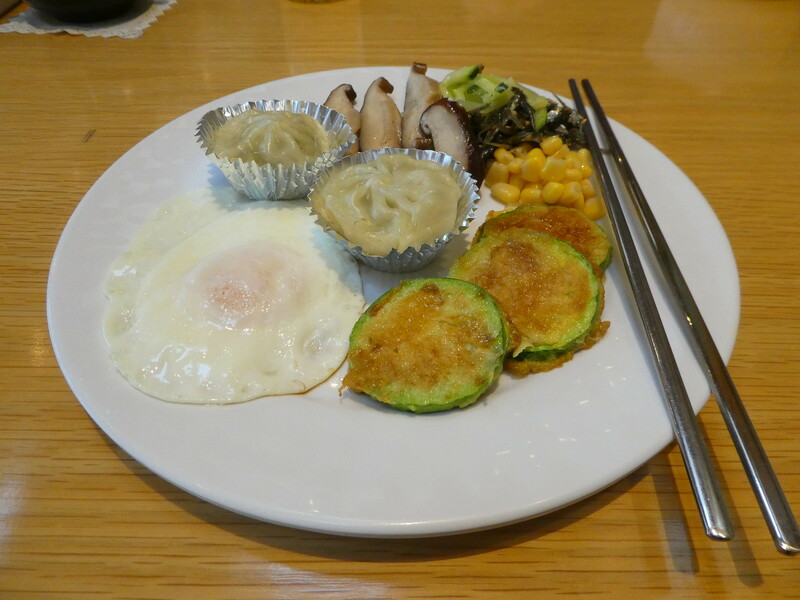 As we weren’t in a rush, we enjoyed a leisurely breakfast in the hotel’s 13th floor restaurant. The Arban Hotel had exceeded expectations and I would recommend it as a good place to stay in Busan. Returning to our room, we gathered the last of our belongings together and after checking out, left our luggage to collect later. After the previous day’s heavy rain, it was an overcast morning, but at least it was fine. 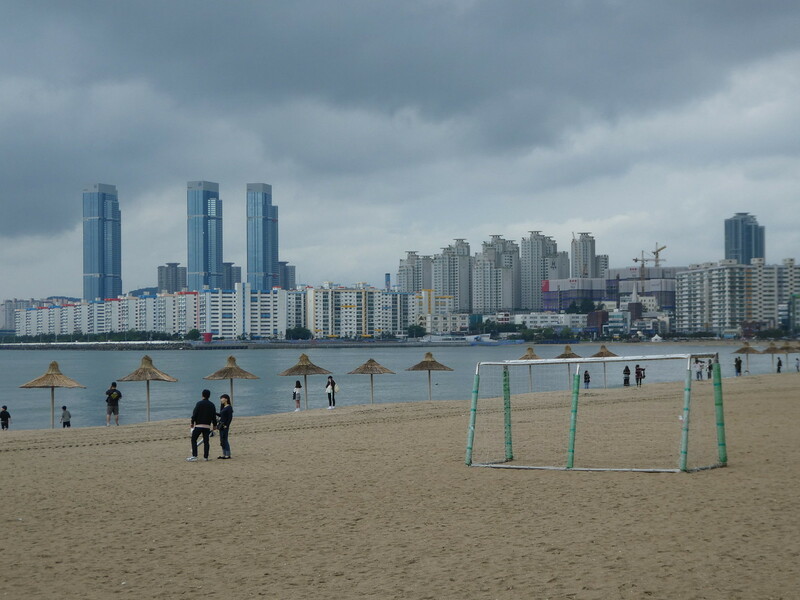 We took the metro to Gwangan station and it was then a ten minute walk to Gwangalli Beach which is famous for its fine sand. 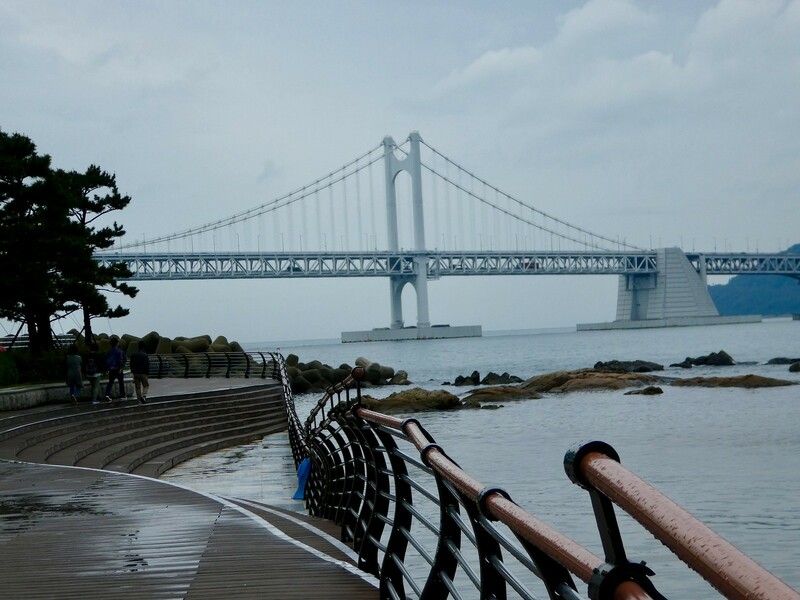 We strolled along the curved, half moon shaped beachfront which stretches for 1.4 km from where we could see the huge Gwangandaegyo Bridge which spans over 7.4 km making it the longest twin level bridge in South Korea. The bridge is fitted with thousands of LED lights and many people visit the beach in the evenings to watch the sunset and view the light show. The promenade is lined with cafes, bars and restaurants making it a popular summer holiday destination along with its neighbour, Haeundae which we had already visited. 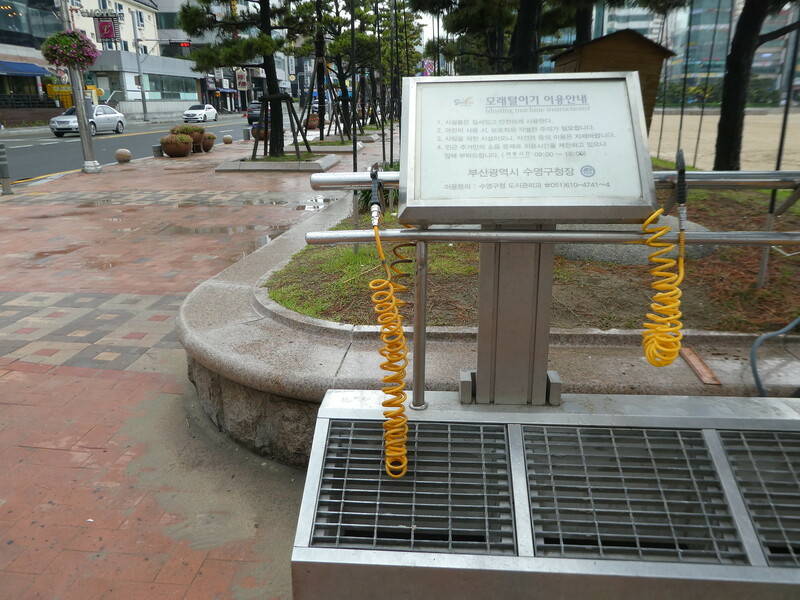 I was intrigued to see ‘dusting stations’ along the seafront. These compressed air-lines are a brilliant idea for blowing sand off your feet after coming off the beach and it was the first time I had seen them. Before returning to Seomyeon we popped in a cafe for hot drinks and then took the metro back to the hotel to collect our luggage. 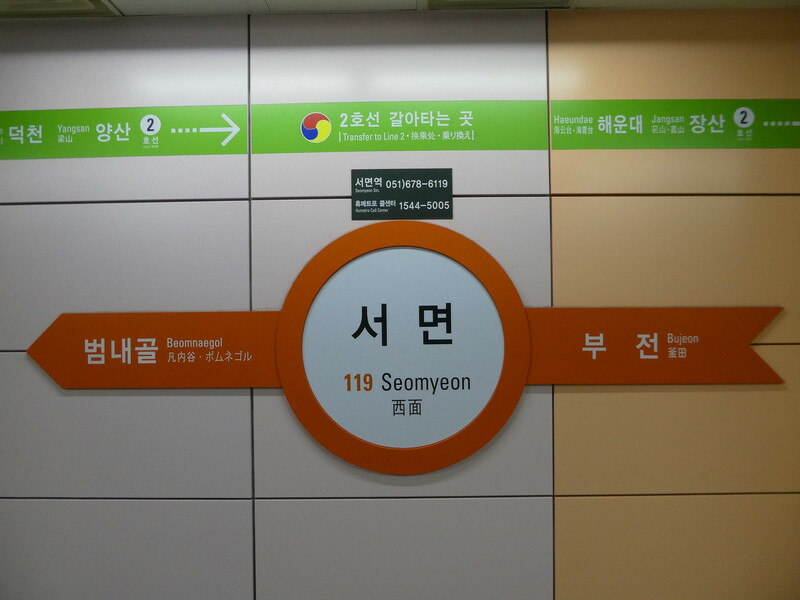 Transporting our luggage back to Busan Station was easy as the metro was fairly quiet and there was step free access. Our train back to Seoul wasn’t ready for boarding so we just had time for an ice cream before taking the lift down to the platform. 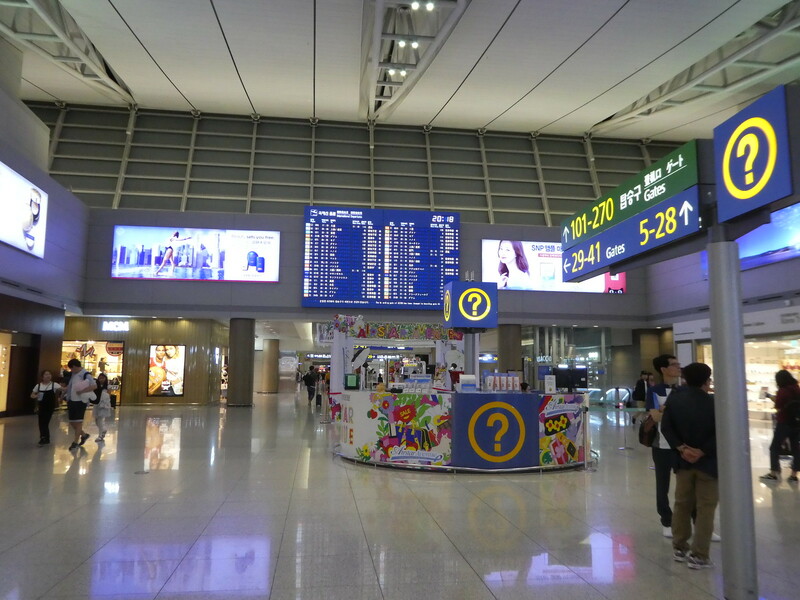 Our Korail service departed punctually at 3.10 p.m. taking only two and a quarter hours, including two stops, to reach Seoul. As with the outward journey, our standard class seats were very comfortable and at the end of each carriage there was plenty of storage space for our large suitcases. Back in Seoul Station we topped up our T-Money cards for the final time so that we had enough credit on them to enable us to return to Incheon Airport. We returned to the airport on the AREX all stop (commuter train) which takes 55 minutes and costs 4,500 Won (£3.13). Passengers also have the option of using the Arex Express (non-stop) service which takes 43 minutes and costs £5.90, including a guaranteed seat reservation. There was only a short queue at the Turkish Airlines check-in desk and we were soon passing through security and looking for an airside cafe for a pre-flight snack. Incheon Airport lays claims to being one of the fastest in the world for customs processing and it seemed to be the case on both our arrival and departure through the airport. 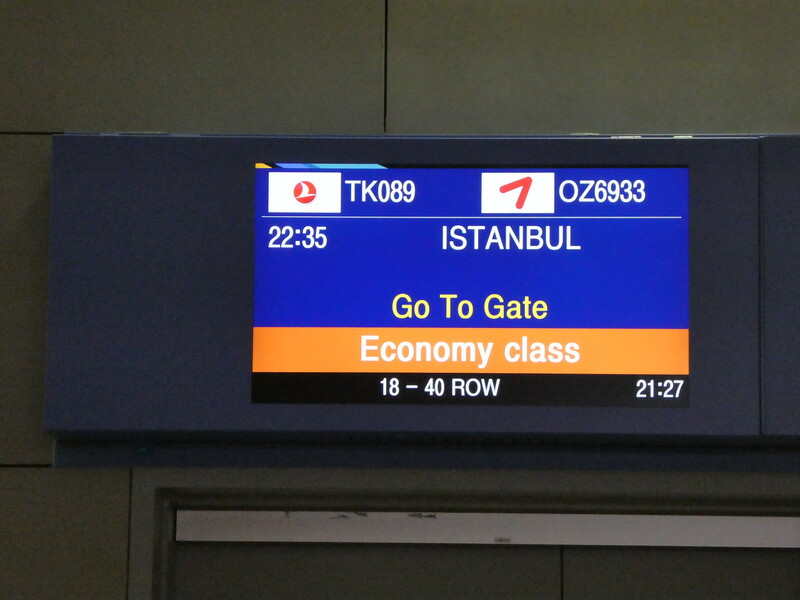 Our 11 hour 40 minute overnight flight to Istanbul departed on time at 22.35 with only about 25% of the seats occupied as there was also another flight scheduled for the same route one hour later. Dinner was served promptly and my green salad with prawns tasted fresh. 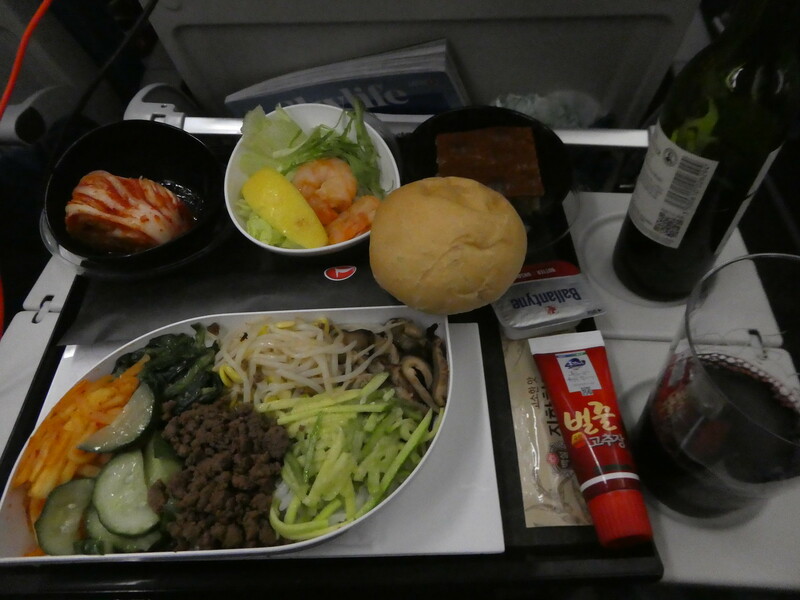 The main course choice was either grilled cod with spinach or bibimbap (rice with beef and vegetables) which I selected. This came with a tube of chilli paste for diners who prefer it spicy. To accompany our coffee, there was a slice of carrot cake which was nice and moist. Before getting a few hours sleep I watched the film ‘The Mountain Between Us’ starring Idris Elba and Kate Winslet. Perhaps a strange choice for on board a flight as it was about a tragic plane crash, but I’m not a nervous flyer. The film was quite good and after it finished it was approaching 1.00 a.m., and I soon fell asleep. I must have slept for quite a long time as the flight map indicated there were only two and a half hours remaining which passed quickly with a breakfast service passing through the cabin an hour later. Our early morning meal comprised fresh fruit salad, a tasty cheese omelette and a roll and jam. 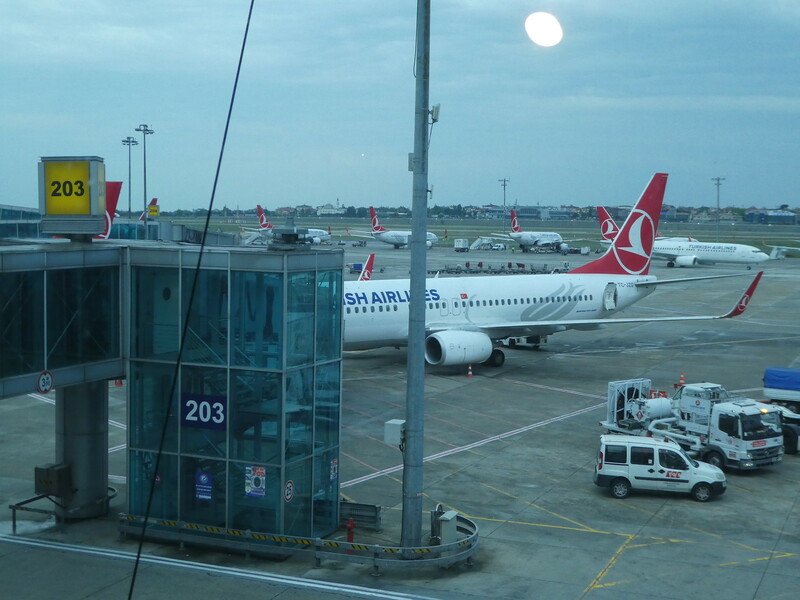 Back in Istanbul’s Ataturk Airport it seemed much quieter than during our outbound transit and after stretching our legs awhile we settled down on seats by a window so that we could watch planes preparing for take off. Ataturk Airport supposedly has free wi-fi but it was difficult to access and when we did manage to connect, it was very slow and kept cutting out so we soon gave up trying. Unlike our overnight flight from Seoul, our 3 hour 55 minute flight back to London Gatwick was full. 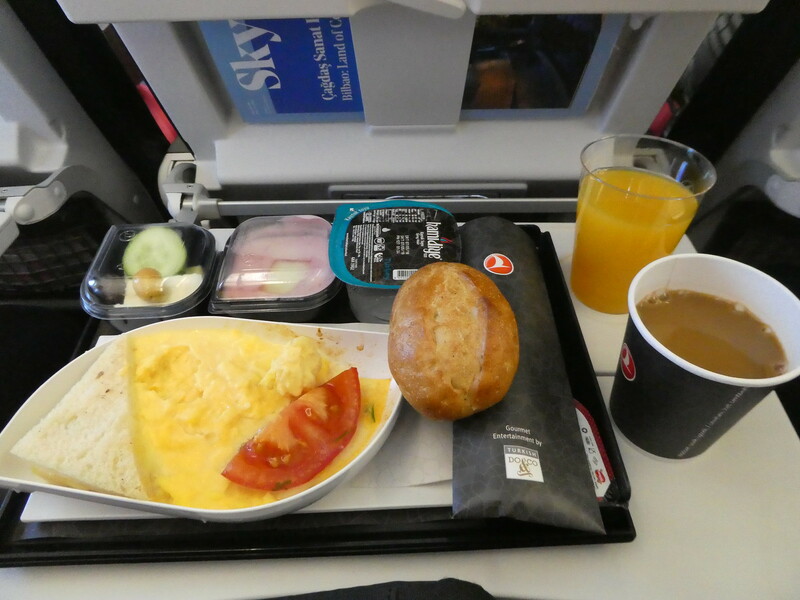 Turkish Airlines service on short haul flights is very good with a full meal being served and in-flight entertainment available on seat back screens. 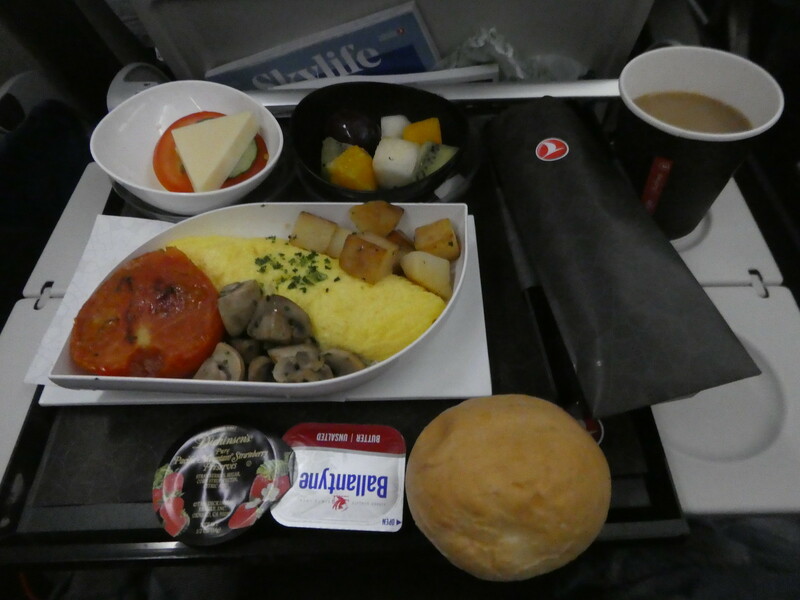 It was to be our second breakfast of the day as our flight into Gatwick was scheduled to arrive at 9.30 a.m.
Safely back in London we were greeted with warm sunshine and after reclaiming our luggage we made our way to Gatwick’s railway station for our journey home. 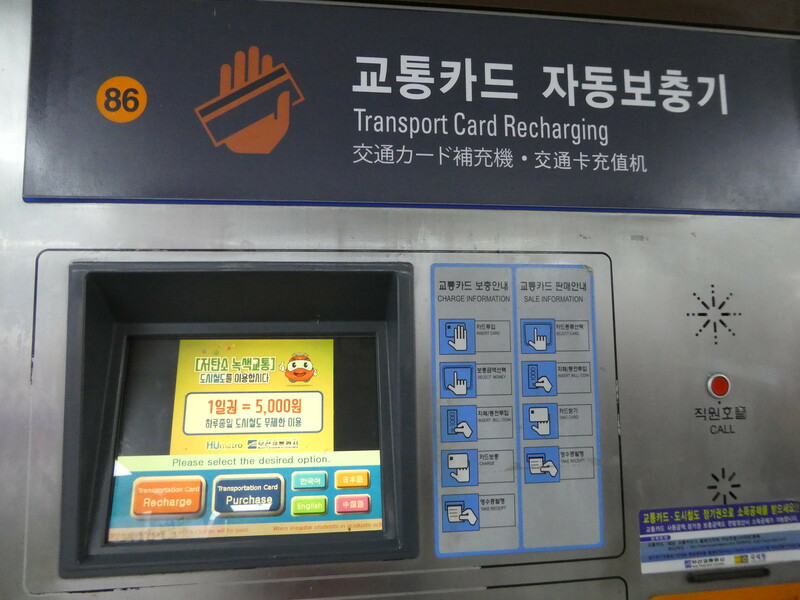 We travelled around South Korea using public transport which was inexpensive, safe and easy. To give an indication of costs, I’ve detailed our expenses below. T-Money Cards: 85,000 Won (£59.00) each. This was the total amount spent on using the public transport (metro, local trains, buses and the Arex airport train (to and from Incheon Airport) for the duration of our stay (16 days). One free transfer (metro/bus) is valid on each journey within 30 minutes. Do please remember that when travelling by bus it is necessary to tap in on entry and then tap out as you alight to avoid being overcharged. T-Money cards can be used around the country offering a seamless form of payment and can also be used to purchase items in convenience stores. Although T-Money cards can be purchased with a credit card, adding value to them can only be done using cash. 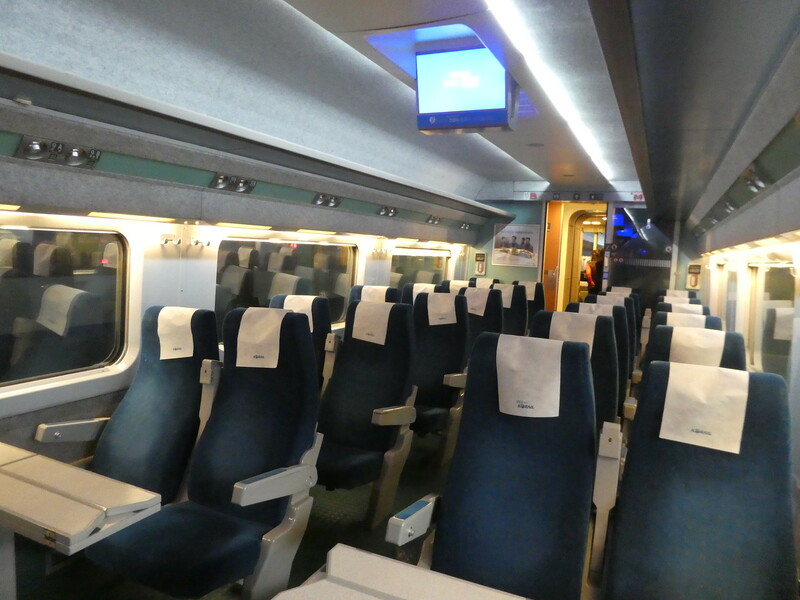 Korail Pass – 90,000 Won (£63.00) each for a 2 day select pass (non consecutive days) for two passengers who are travelling together. This can be purchased in advance and reservations for specific journeys made up to one month in advance. When travelling, passengers need to be in possession of their Korail Pass, ticket reservation and passport. I hope you have enjoyed reading this series of posts on our first visit to South Korea. We had so much fun exploring cities, palaces, national parks and the southern coast returning home with happy memories of our visit. We came across very few western visitors but hopefully after reading about our first hand experiences in this beautiful country my posts and photographs might inspire some of you to explore South Korea yourselves! I would like to thank both the Arban Hotel Busan and the Holiday Inn Express Seoul Euljiro for hosting us during our stay. As always, all views and opinions are entirely my own. Thank you for your lovely comments. I adored South Korea and can’t wait to return. Would love to visit Japan one day. Whereabouts are you based? It’s my pleasure Amelia. It’s so nice to read that my Korean posts brought back such fond memories for you. I have seen your name on my blog a few times. Now it is so amazing that we arrived in Korea on the day you left. We may have passed each other at the airport? I have replies switched off on my blog site, but I’ve noticed your ‘likes’. What a coincidence! I hope you have a splendid time in Korea, I’m certain you will love t! Thank you so much for your kind words. It’s so nice to read that you enjoyed my series of posts on Korea. Thank you. It’s good to hear that you enjoyed my series of posts on Korea. A wonderful trip full of interest and great pictures! Thank you so much for sharing. It’s my pleasure Sue. Thank you so much for joining me on my Korean adventure and for your kind words. and the younger generations are far more in tune with a spirit of acceptance. I’m glad your visit to that beautiful land went well. We had a wonderful holiday in Korea and definitely want to return before too long. Your nice comments mean a lot, thank you. Thank you for following along on my adventures in South Korea and for your much appreciated thoughts. The public transport is safe, efficient, clean and very reasonably priced. Thank you for your kind words. I do hope that you get an opportunity to visit South Korea soon. Enjoyed reading this post and really liked the dusting station as well as the steel chopsticks, amazing! Thank you for your kind words. It’s so nice to read that you have enjoyed this post and like me thought the dusting station was a good idea! This was an amazing series! I also like the dusting station idea. Did you ever feel like language was a problem? Thank you so much for your kind words and for following along on my Korean adventure. The dusting stations are great ideas and will probably pop up elsewhere eventually! 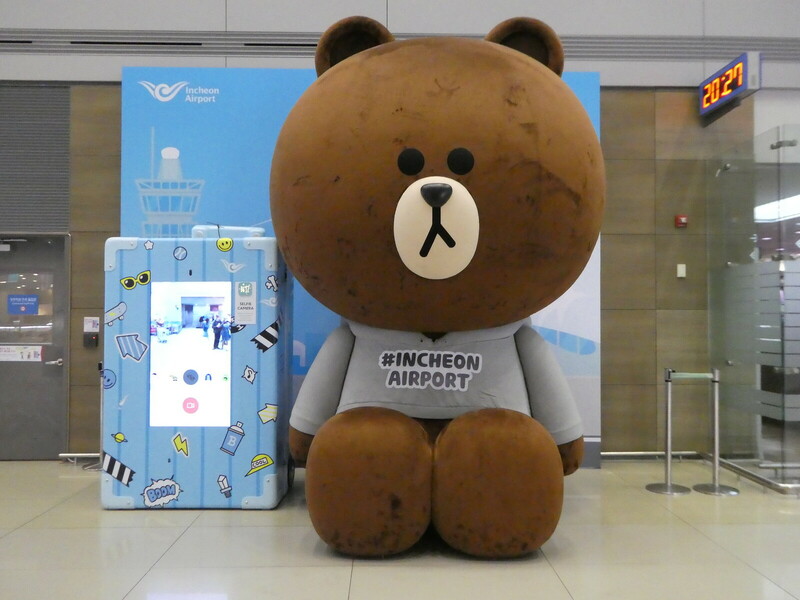 Your blog entries certainly make South Korea look like an enjoyable place to visit! I’m not sure that I’m quite ready for that long of a flight just yet though. I found flying from Portland to Chicago to Harrisburg (a total of 6 hours in one day) to be exhausting enough. I think I will need to venture to Europe first before I tackle any farther places! Hi Tracy, Thank you for coming along on my journey to South Korea. I hope you get to visit Asia sometime as I’m certain you would enjoy the experience. Thank you for your kind words. I’m pleased that you enjoyed this series of posts. Shame your Korean adventure is over, I’ve seriously enjoyed following your journey. It’s looked amazing and has opened my eyes to Korea as a place to visit. Where to next then? Thanks Jonno for following along on my adventures in South Korea. I do hope you get an opportunity to visit before too long. Stay tuned for my upcoming travels! I’ve really enjoyed your South Korean journey. Read: I’m super jealous! South Korea has been a big goal of mine for years. I will certainly refer to your itinerary when I finally get there! Thanks for following along with my journey through South Korea and I do hope you get a chance to visit before too long! Thank you Misha for your kind words. One day I hope to visit the Indian sub-continent, I’m sure it will be amazing! Thanks Jo! Perhaps dusting stations will be heading our way soon! Great job, Marion, you convinced me! I think this will be my next summer’s trip. Thank you so much for your tips! Thank you for your kind words Cosino. I do so hope you get to visit South Korea next summer as I’m certain you will have an amazing time! M.